Before I go in to too much detail about my solution, I need to cover some background. As I only own one of his books, only only listened to The Rookie podcast, it would be hard for me to say that I am a fan. He was inspiration for several other Authors that inspired me, which includes Nathan Lowell. As a New York Times best seller, he was going to visit Europe to do a book Tour. As I didn’t know he was in the UK until he was already leaving the UK, I missed my chance to see him at the moment. Unlike Scott Sigler, who uses Apple Products almost exclusively. I was using a Asus “Nexus 7” 2013 model. This is a smaller tablet not much bigger than a iPad Mini. My Nexus runs Android M and ran Android L during one of the trips. It’s way lighter than my own Laptops, “Acacia” and “Lana,” which are noticeable heavy as portable hardware goes. While Scott uses Scrivener for novels and Final Draft for screen plays. I only needed to keep track of Novel and this blog. With my Novel planner/editor being yWriter 6, and no Android version known. I chose to adopt another method. I use an app called Evernote, which I’ve had for since 2009, and sync text between PC and Android via the Cloud with little trouble. I created a notes for each scene and then copy/paste the result in to yWriter. This method is very similar to how I started Acacia’s Silence in “I didn’t type all my book” other than I didn’t backup online back in 2004. While I have access to every note I made as long as I was online, and select few when offline, I could get in to trouble if I want to fact check another scene, usually from the cancelled “The Fall” or a scene that didn’t get in Evernote. However I usually don’t encounter this issue, I should have done a fact check resulting a character being renamed. For Scott Sigler, working on the book 6 of the GFL series (starting with The Rookie) means he got alot more tracking to do, where I only have the short story The Bar Mage of the Golden Sea set in stone. As for writing in this Blog, there is a WordPress app, which lets me do most of the daily tasks that I need to keep this blog working. The editor is exactly like the pages that I use to add these posts. I however never update using the app, partly as I had either a PC or laptop nearby when I updated. It however will let me add pictures and various other things I may need for a Post, as if I was on my PC. On occasion I’ve posted Youtube videos, Via the Youtube app I have near full control of my account as if I was on my PC. Only Closed Captioning/Subtitling is missing. Sadly, the small amount of size internal Memory and no micro-SD card slot in the Nexus 7 would limit what I could upload. As for email, we used the build in email app for our devices. I used the Gmail app on both my phone and tablet, while Scott used the Apple version. As for Facebook and Twitter, the apps offer almost full functionality. As for Instragram, I must use my tablet as I can’t add images using the official app on a Windows PC. 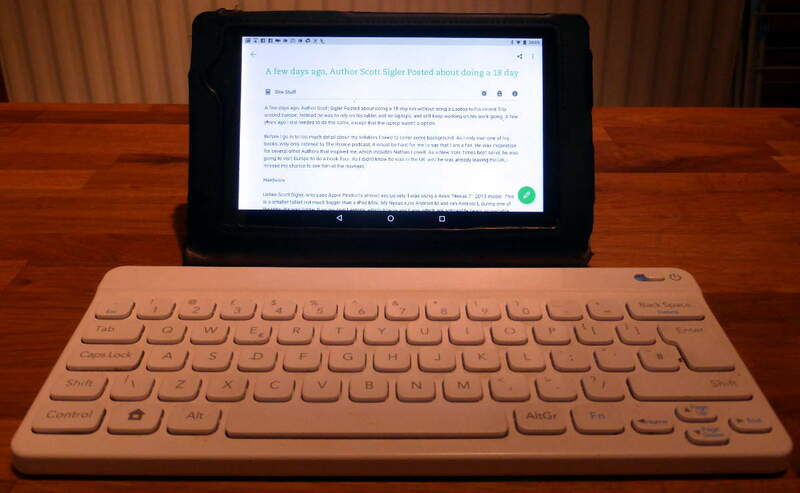 My Nexus 7 tablet and the Nintendo keyboard. Like Scott, I also have keyboard that I can use with Tablet. I use the Nintendo Bluetooth keyboard, which was only sold with one game. It’s almost the exact size of my tablet, so finding a spot to place it isn’t trouble. It’s pretty unique in the hardware I use in that it uses 2 AA batteries, not a USB charger. As a keyboard, it feels better that some “tablet case” keyboards that I’ve tried. I sometimes use a proper digital Camrea, unlike the ones I had before, this has support to send photos from the Camera straight to the Tablet, using NFC. This could mean I wouldn’t need to grab the tablet every time I wanted to take a snap for the blog. So as Mike Sharpe Writer, I could last a few weeks without having a PC or laptop, and you may not even notice. The only thing that I could not create for Mike Sharpe Writer work during would be the 3d renderings that I occasionally use featured images, and most of the ability to self-publish books in any form. Where the iPad Pro can run split screen or two apps on the same screen. My tablet lacks the functionality as split screen feature added in the latest version of Android. This however more of an inconvenience than preventing from doing work, as flipping between apps is possible, as using my smart phone as a secondary screen. My other Business SharpeWebDesign on the other hand, almost just can’t function without a laptop. All the software I use is built for a PC or a Mac, and for the few web apps that I use don’t load on a tablet or smart phone. Also, some of the tools I would need as a Audio, photo or video editor on tablet can be harder to work with due to the the way we need it to work, and various functions just are not present. While not a tablet issue, Scott failed to sync all his files needed with his iPad Pro. I can understand as if I’ve come across similar issues with my own tablet being out of date due a power cut to my main Pc. Modern tech today is now really getting to the point where 90% of the day to day computing can be done on smartphone, or a tablet, rather than a series of boxes that cover a single desk. It’s possible to keep several businesses going with the tablet being the only computer. Authors like myself and Scott Sigler are somewhat proficient in todays modern tech, despite Scott claiming to be a TechTard. However both Scott and I both still need access to a Laptop or a Pc to keep us working. The various shortfalls of various apps hold the hardware back to some degree. Anyway, who knows my game list of 2017 may include an Android title.